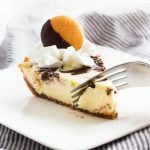 Chocolate marble cheesecake pie is decadent, rich and made with a vanilla wafer crust. It is the perfect dessert to bring to parties with family and friends. Let’s talk cheesecake. It has got to be one of the most decadent and satisfying desserts. It’s rich, creamy and there’s nothing else quite like it. Today I’m sharing a recipe for chocolate marble cheesecake pie with a vanilla wafer crust. While most cheesecakes are made in a springform pan, I decided to make this one in a pie dish. It makes the baking process a little less messy and eases my mind when I put the pie dish into a water bath. Usually cheesecakes have a graham cracker crust, but I wanted to mix things up a bit. Instead, I used vanilla wafers to make a sweet, buttery crust for the cheesecake pie. 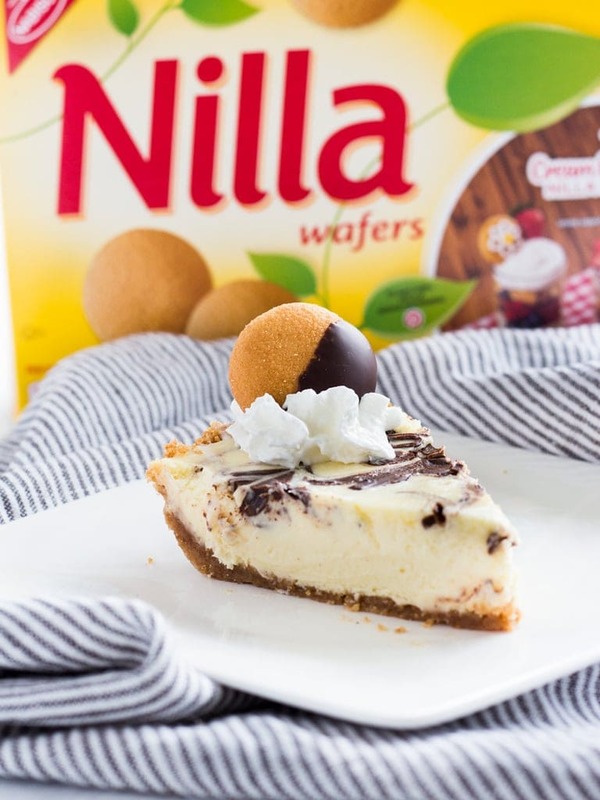 The process to make a vanilla wafer crust is very similar to that of a graham cracker crust. Simply crush the NILLA Wafers in a food processor (you can also do this by hand in a large ziplock bag), then stir in the butter and a couple tablespoons of sugar. Press that mixture into a pie dish and your crust is ready to go into the oven! I found that using vanilla wafers made a sweeter and more buttery crust, which is perfect for cheesecake. It adds its own texture and flavor to complement the rich cheesecake filling. The cheesecake filling is delicious on its own, but when it comes to cakes (cupcakes, cheesecake, any kind really), I’m all about the garnish. I couldn’t leave these cheesecake as is, so I used to melted chocolate to create a marbled effect. This process is surprisingly simple. Melt half a cup of semisweet chocolate chips and let is cool slightly. Then drop dollops of chocolate onto the unbaked cheesecake filling and use a tooth pick to create that marbled look. Piece of cake! I will say this though, the cooling step is important. If you don’t cool the melted chocolate slightly, the heat will cause the cheesecake to seize up when you start to stir the chocolate into the filling. I say this from experience, so let that chocolate cool a bit before marbling! And just to stay with the vanilla wafer trend, I added a little more garnish when I was ready to serve the chocolate marbled cheesecake pie. A dollop of whipped cream and chocolate-dipped wafers did the trick. I love how those little extra steps takes an otherwise ordinary cheesecake pie to something extraordinary. Decorating cake (even cheesecake!) really is an art. 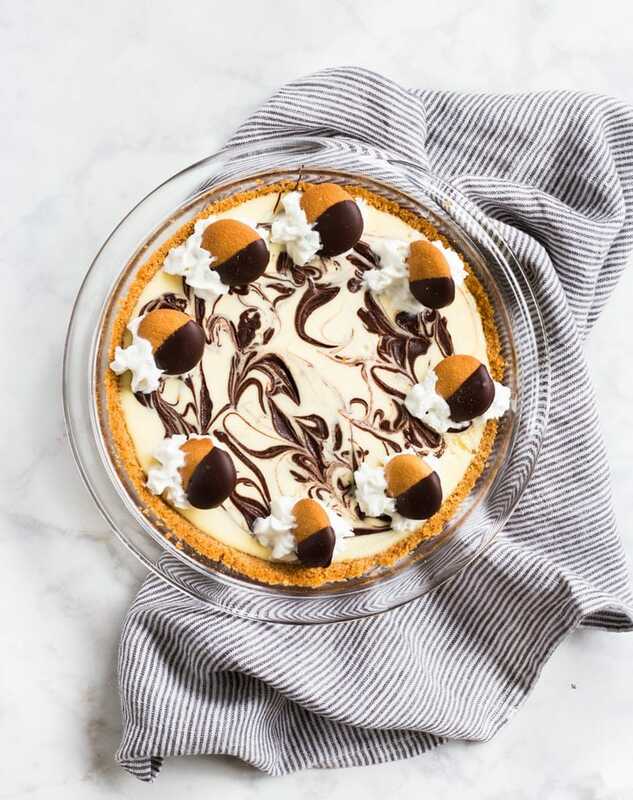 Cheesecake fans, it’s time to impress your friends and family with this chocolate marbled cheesecake pie. Not only will the dessert look gorgeous, but it will taste delicious too! 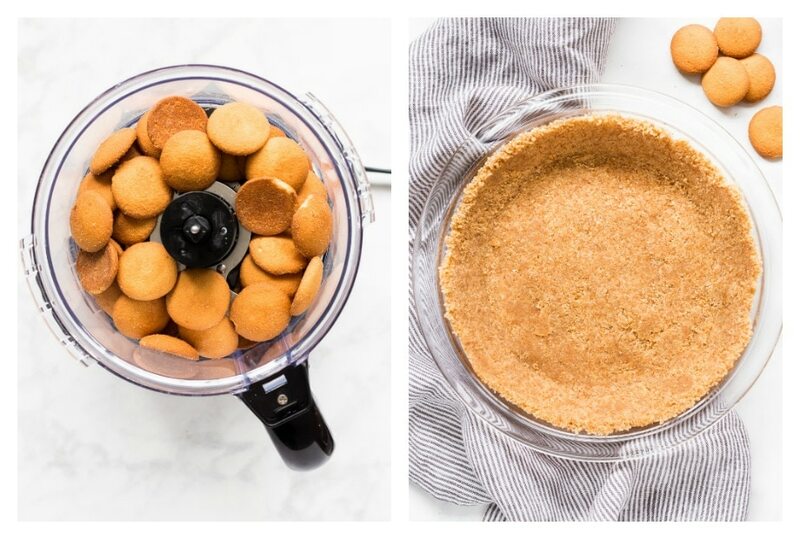 In a food processor, pulse vanilla wafers into fine crumbs. Add melted butter and sugar and pulse until crumbs are evenly moistened. Press evenly onto the bottom and up the sides of an ungreased 9-inch pie dish. Bake at 350° F for 8-10 minutes or until crust just begins to brown. Cool completely. Preheat oven to 325° F. Place chocolate chips in a microwavable bowl and microwave for 2 minutes at 50% power level. Stir every 30 seconds to ensure even melting. Set aside to cool slightly while you make the cheesecake filling. In the bowl of a stand mixer (or using a hand mixer), beat cream cheese until very smooth, about 1 minute. Mix in sugar until combined. Add eggs and egg yolk, one at a time, beating until combined after each addition. Add sour cream and vanilla and beat until very creamy, about 1 minute. Pour filling over cooled crust. Gently drop dollops of melted chocolate on the top of the cheesecake filling and use a toothpick or knife to swirl the chocolate. This will create a marbled look. Place the pie dish in a large roasting pan and add water into the roasting pan until it reaches half way up the sides of the pie dish. Bake for 45 minutes at 325° F. The cheesecake should still jiggle in the center (it will firm up after chilling), and the edges should be mostly set. After 45 minutes, turn oven off and crack oven door open. Let cool in cracked, oven for 30 minutes. Remove cheesecake from oven and let cool completely on a rack then chill in refrigerator for at least 4 hours, best if overnight. Melt chocolate chips in the microwave on 50% power for 2 minutes, stirring every 30 seconds until chocolate chips are melted. Dip vanilla wafers halfway into the melted chocolate and place on prepared baking sheet. Place baking sheet in the refrigerator and chill for 10 minutes. 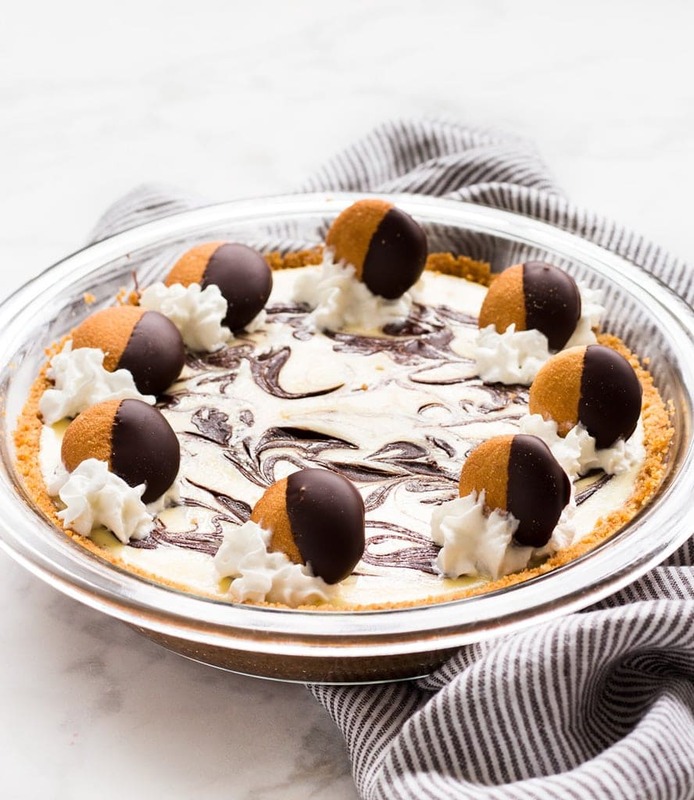 When ready to serve, garnish the cheesecake pie with whipped cream and place chocolate-dipped Vanilla wafers in the whipped cream as garnish. Serve immediately. 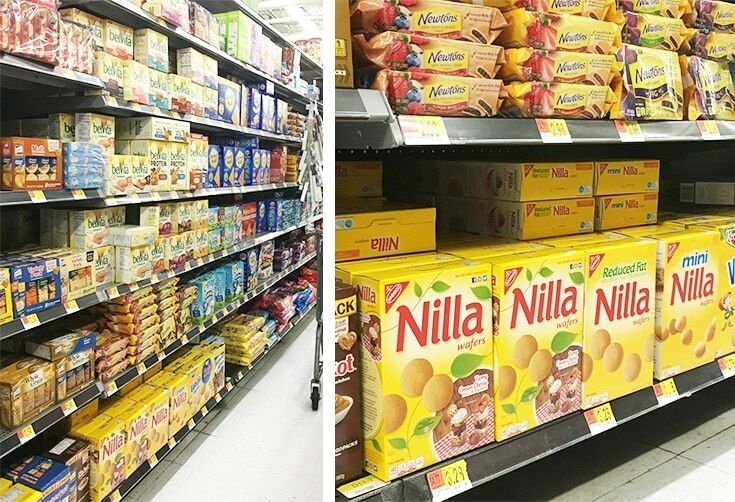 If you’re shopping at Walmart, here is a visual of where I found the NILLA Wafers in the snack aisle. Marvelous! The very first cheesecake I ever made (called cheesecake pie and this was back in the 1970’s) was in a pie tin and used vanilla wafers! It wasn’t quite as glorious as this marbled beauty! This look amazing! I simply love cheesecake and I’m excited to try one without the spring form pan! 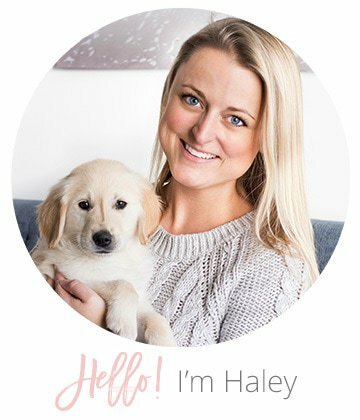 I’m visiting from The Pin Junkie Link Party. 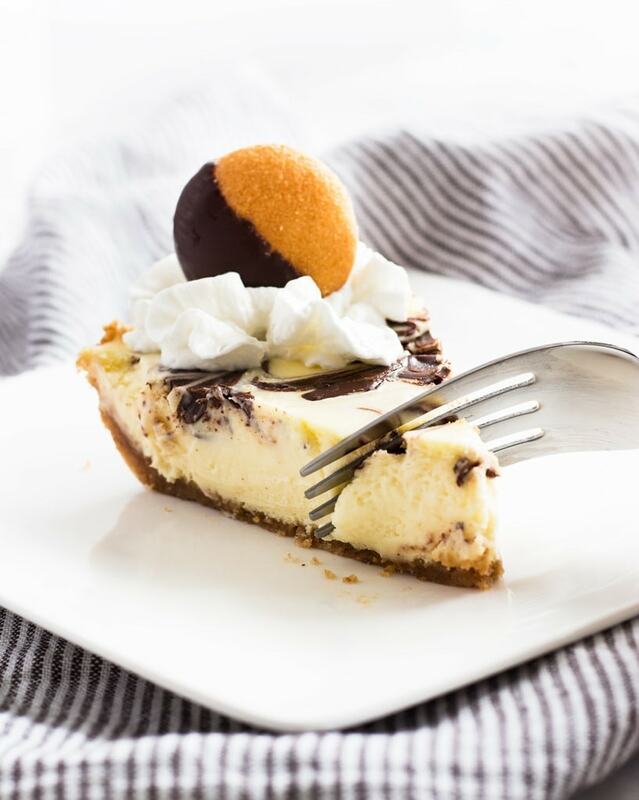 Your chocolate marble cheesecake pie looks delicious! I love the idea of using a vanilla wafer crust. I’m going to try that for my next pie. Thanks for sharing at Snickerdoodle. We’ll be featuring this at today’s party. Hope to see you there! I love love love love cheesecake! I can’t get enough of it. I’m so going to try and make this one day.